The Servox Digital electrolarynx, the world's finest voice prosthesis speech aid, incorporates the latest technology to ensure trouble-free use and optimal speech readiness at all times. Independently programmable buttons enable you to speak with a distinctly individual voice. 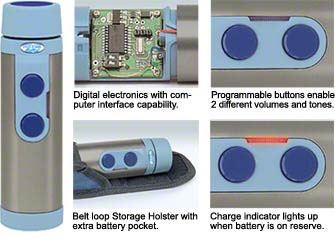 The Servox Digital Speech Aid for the laryngectomee has digital technology that allows the combination of two different volumes with a unique pitch for each button. It is now possible for you to easily adjust your Servox Digital electrolarynx to an infinite number of personal settings. Once the Servox Digital Speech Aid is set to your personal preferences, you will no longer have a need to adjust the volume for battery drain. An elaborate Digital Power Management System maintains constant volume throughout each battery charge and increases speech duration by reducing energy consumption. To ensure peak performance, the power management system protects your battery from being completely discharged. A flashing red light will remind you when your battery is on reserve and requires charging. The new Digital Electronic Charger is designed to charge both your Servox Digital and an extra NiMH battery at the same time.